Wed., Sept. 12, 2018, 7:10 p.m. The overworked and underpaid preps writer and the debonair and charming TV anchor tied last week at 3-3, so I still hold a two-game advantage (Nichols 7, Adams 5) heading into Week 3. It’s an interesting slate of games this week and we’ll start finding out whether some of these teams are good – or just got off to a good start. League races will also start to come into focus, as the Greater Spokane League schedule features all six 4A teams against each other. Gonzaga Prep (1-1) at University (2-0), 7 p.m.
Nichols: The featured game this week, as the Bullpups try to exert their traditional dominance against the upstart Titans, who have been impressive on the road against a pair of Idaho teams. G-Prep has been outscored overall so far this season in a loss at Coeur d’Alene and a tight win at home last week over St. Ignatius. G-Prep had two backs eclipse 100 yards, including QB Connor Halonen. U-Hi has posted 40-plus points in its two games, including its 43-37 win over Post Falls last Friday. Christopher Taylor rushed for 132 yards and three scores while the quick-strike combo of Gavin Wolcott-to-Kye Duplessis was limited to one catch. I wouldn’t be surprised if U-Hi pulls it off, but … G-Prep 30-28. Adams: Gonzaga Prep rushed for an astounding 412 yards in last week’s 42-37 win. That’s the mark of a team that knows its identity and it works well – if it has the lead. But we also saw how that worked out for the Bullpups when they had to play from behind in a season-opening loss to Coeur d’Alene. I really like University’s chances, and if the Titans can get an early lead, they could pull out a big win. But I think the Bullpups will play with a sense of urgency, especially on the road against U-Hi. G-Prep 31-28. Lewis and Clark (2-0) at Central Valley (1-1), 7 p.m.
Nichols: Central Valley, ranked No. 10 in state 4A by the Associated Press, rebounded from a loss to Bellevue (No. 3 in 3A) in its opener with an 11-point win over Garfield (No. 10 in 3A) in Seattle. LC’s defense is good – allowing an average of just 11 points, best so far in the GSL. It all comes down to whether LC’s offense can keep the ball long enough, limiting CV possessions, and turn those drives into points. CV 31-24. Adams: The Tigers are off to their first 2-0 start since beginning the 2011 season at 6-1. Now LC gets its first true test with a road trip to always-tough Central Valley, in a game that will reveal an early title contender for the 4A crown. My monopoly money is on the Bears, who scored 39 last week at Garfield, and will lean on the trio of Matt Gabbert, Hunter Chodorowski, and Ryan Harper. CV 24, LC 14. Mead (1-1) vs Ferris (2-0) at Albi Stadium at 8 p.m.
Nichols: The Panthers had a tough time getting going against Coeur d’Alene last week, shut out in the first half. 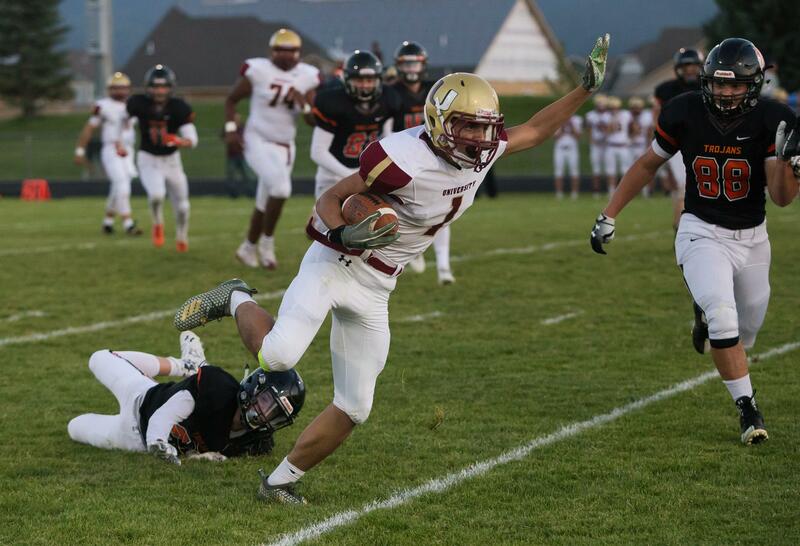 But Michael Workman caught seven passes for 231 yards and two scores for Mead as it nearly pulled off the comeback. The Saxons got an 82-yard kickoff return TD and 60-yard TD catch from Brock Bozett in a win over Lake City, which was more impressive than the final score of 31-22. Mead 40-21. Adams: The Panthers looked like a completely different team in the second half game against Coeur d’Alene, rallying back from a 20-0 halftime deficit in a 47-34 defeat. Ryan Blair was a big reason for the rally, throwing three TD passes in the second half in relief of starter Ryan Chan. Regardless which Ryan is under center, I think Mead is starting to turn the corner. Mead 35-21. Shadle Park (1-1) vs Cheney (2-0) at Roos Field at 6 p.m.
Nichols: The Blackhawks already have a win over a GSL 3A squad, routing Rogers 38-7 last week, putting up 295 rushing yards on the board in the process. Five Cheney players scored touchdowns, not including leading rusher Max Pierson, who carried 11 times for 122 yards. QB Carson Doyle rushed for 114 yards with two touchdowns and the visiting Highlanders benefited from a fourth-quarter safety to edge West Valley 16-14 last week. Cheney 24-10. Adams: Shadle got my attention with its win over West Valley, using a combination of grind-it-out offense paired with a stifling defense – after being shut out by Lewiston the week before. I expect Cheney to get up for this game, especially playing on the red turf, and it could go down to the wire. SP 21-17. Moscow (0-3) at Pullman (2-0) at 7 p.m.
Nichols: The backyard brawl on the Palouse. The Greyhounds come in ranked No. 10 in state 2A and led North Central 42-0 at halftime last week, settling for a 45-13 win. Konnor Kinkade finished 11 of 14 for 183 yards and four touchdown passes. The Bears have had just one of their three losses within 10 points. Pullman 44-13. Adams: Pullman has looked impressive in its first two games and now the Greyhounds have the motivation of a rivalry showdown with Moscow. Isaiah Strong – yes, that’s former Seahawks fullback Mack Strong’s son – has been a one-man wrecking crew. I expect him and the ’Hounds to keep it going against Moscow. Pullman 42-14. Lake City (0-3) at Lakeland (2-0), 7 p.m.
Nichols: Lakeland has beaten Rogers (28-14) and East Valley (27-7) handily so far with Brandon Furey leading the offense at quarterback. Lake City has made some progress the last couple of weeks keeping the scores closer. Lakeland 28-14. Adams: You have to go back to 2011 to find the last time these teams met – despite their proximity. Traditionally, 5A Lake City would be the prohibitive favorite, but the Timberwolves are off to a shaky start, while Lakeland has a bit of bounce in its step. I think LC’s tougher schedule will make the T-Wolves prepared in Rathdrum. LC 16-13. Published: Sept. 12, 2018, 7:10 p.m.